If you intend to make some beauty shopping during your stay in New York, you are in the right destination for this. The city is a true beauty paradise, as I have already told you here on the blog. More than Sephora and drugstores, Big Apple has several other well-known and unknown brand stores as well as niche stores and … Korean cosmetics stores! For the past three years, Manhattan has become the target of Korean brands. Many of them were already based in Flushing, Queens, but they saw in the island an opportunity to expand their business. Today, you can make this type of purchase without having to go to the other boroughs. And whoever follows me for a long time knows my love for Korean cosmetics. Brands are always lauching trends and the Korean consumer is demanding – so we can expect products of the highest quality. I posted a video a few weeks ago suggesting some Korean products to buy around here. But I decided to bring the list to my blog as well and I took the opportunity to increase the list. The shops locations are on the map at the end of the post. Cushion – the great thing about cushion is in its innovative design. The product – foundation BB Cream or CC Cream – stays in a compartment under a sponge. You lightly squeeze the applicator on the sponge for the product to come out. The application is easy and practical and the applicator provides natural coverage. In addition, the product does not leak. Another advantage: the sunscreen is always high! Brands like L’oréal and Physicians Formula have copied the concept. It’s a fever! Suggestions:Color Control Cushion Compact SPF 50+, Amore Pacific U$60 (with refil) / Kill (All That Cover) Liquid Cushion Set, Clio Professional U$45 (with refil). Wash off mask – Although sheet masks are quite popular and have become a thing, I confess that I still prefer the wash off masks. For those unfamiliar with the term, these are the masks that you apply on the face, wait and then wash. I love the feeling of clean and velvety skin! Suggestions:Carbonated Bubble Clay Mask, Elizavecca $15 – you apply it and you will see bubbles, it’s fun! /Egg White Pore Mask, SkinFood $15 – one of my favorite masks, skin gets so soft… /Egg Mousse Pack, Too Cool for School U$20 – it’s a mousse, you apply it and your skin is gonna absorb it. /Greek Yogurt Pack, Nature Republic $16 – with yogurt texture, helps to moisturize the skin and provide nutrients. Sunscreen – Korean women are very concerned about the skin – especially about sun damage. Sunscreen is something that is part of the routine – and it should be for all of us. The great advantage of Korean (and also Japanese) sunscreens is the high sun protection factor and non-stick oil-free formulas. Suggestions: Aqua Rich, Bioré , $16 e A-Clear Oil Control, Dr G. $30 – light formulas. / Ice Puff Sun, Nature Republic – $28 – it has a light coverage, a can that keeps the product cold and a cushion style application. Mist – it is the kind of product that Korean women carry in the bag. Weather, pollution, stress from day to day – everything contribute to the appearance of the skin and the Mist is a kind of thermal water, with a rich formula in nutrients, which helps to keep the skin hydrated. Suggestions: Collagen Water, The Face Shop $15 / Pocket Bunny, TonyMoly U$15 / Waterest Fine, Goodal , U$23. Hydrogel masks / pacthes – Hydrogel masks are the sheet masks next level. With jelly texture, they allow the skin to absorb much more from the product. In addition, there are the hydrogel patches, for specific regions of the face, such as the area under the eyes and the lips. Still talking about masks, check the special versions for feet and hands, for a true version of spa at home! Suggestions:Premium Gold Snail Hydrogel Mask, Goodal $60 / Patches TonyMoly – a partir de $4 /Foot Mask & Hand Mask , Nature Republic – $6 em média. BB Cream – BB Cream was created in Korea – that is, we do not have to think too hard to conclude that Korean BB Creams are the best on the market! They always have great coverage and a high sunscreen factor. And they are perfect for day-to-day use. Actually, there are a lot of BB Cream that are better than some foundations. 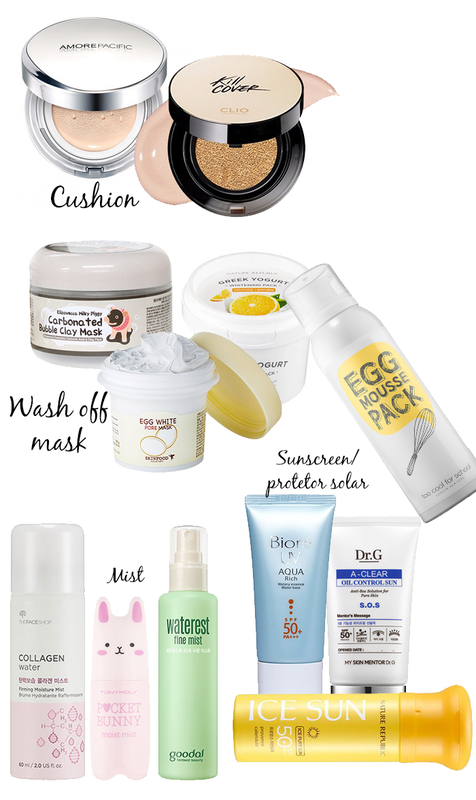 Suggestions: Perfect Cover BB Cream SPF 42 , Missha U$22 / MISA Cho Bo Yang BB Cream SPF30 , Missha U$28 / Peach Sake Pore BB Cream, SkinFood U$18. Sleeping mask – this product, which should be the last step of the skincare routine, is an extra dose of hydration for your skin. I think it is great for those who are lazy to follow a routine, because you just apply it and sleep. It has a cream formula and the benefits of a mask! You should use the product 2 to 3 times a week. Suggestions: Time Response Skin Renewal Sleeping Masque, Amore Pacific, $200 – with green tea formula, that results in a skin smoother, firmer, more hydrated and glowing with radiance./ Water Sleeping Mask, Laneige $24 & Aquasis Water Vital Sleeping Mask Dr. G $36 – both have super light formulas, which provides a radiant skin in the morning. Scrub – cleansing the skin is a basic step in the skincare routine of Korean women and Exfoliation is a key step to remove dead cells. I love the gel peeling, which exfoliate the skin in a gentle way. Suggestions: Phytowash Yerba Mate Bubble Peeling, Goodal $33 – it bubbles in contact with your skin /Black Sugar Mask Wash Off, Skinfood $15 – with black sugar formula, it’s a brand’s best seller. Delineador – Korean brands have great eyeliners, that provide a super precise line, and excellent pigmentation. Suggestions: Japan Sana Liquid Eyeliner Jet Black, Maikohan, U$16 (Japanese) / Kill Black Waterproof Brush Eyeliner , Clio U$20 / Glam Rock Extreme Color Eyes Eyeliner, Too Cool for School U$23. Tinted Tattoo – This product fill the brows, and provides a gradual pigmentation, and the effect can last up to a week. Tinted Tattoo Kill Brow, Clio Professional $20. Skinfood and Elizavecca products can be found at Besfren Beauty. And Bioré and Maikohan at Everyday Beauty Lab. Laneige is available at Target. The rest of the products can be found in stores of each brand.